After watching a movie, you likely have a series of scenes that resonate with you. Likewise, after your target race, you may rewind it in your head to see the actions you took in the race. Using your bike computer and WKO4, it is now even possible to replay the race in your laptop screen. It seems like a daunting task to make a story out from the tons of information displayed on your computer screen. However, it is really easy to do using WKO4 and the new Ride Print Race Analysis Pack. What is The Ride Print Chart? You are probably familiar with the conventional race analysis which may highlight the sections of peak 5 minutes, peak 20 minutes, and hill climbing. Then, it usually tells you effort duration, average watts and watts/Kg. In my opinion, it is too monotonous and it does not sufficiently tell you about how the race was unfolded. You want to replay the important actions, such as breakaways, attacks, counter attacks, and the final sprint. It is now possible to read the story of the race with the WKO4 chart pack I created. It is called “Donny’s Ride Print Race Analysis Pack”. Before going further, please look at the picture below. Doesn’t it look like fingerprint on your hands? Hence, the named “Ride Print”. The graph actually shows you the sections where your power was greater than the mean maximal power 20 minutes recorded for that particular workout or race. You can instantly find the sections of densely populated red color graphs where the hard efforts, such as fast tempo, hill climbing and attacks are. These sections can be selected and named as the picture below for further analysis. 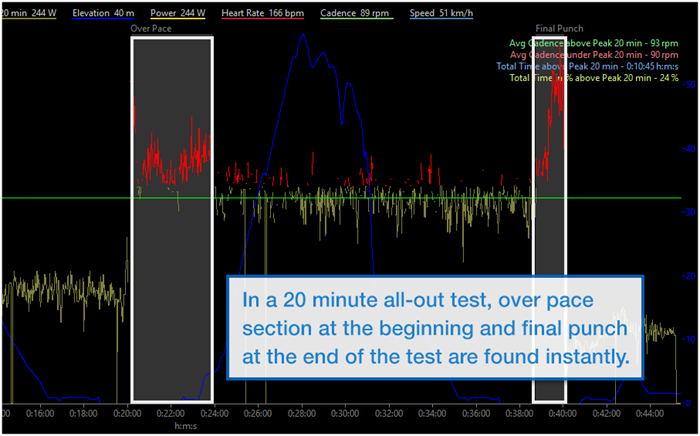 Why do we use the mean maximal power 20 minutes rather than your FTP? It better represents the race effort by acting like a threshold within the race. It is a race specific moving target, up and down, depending upon how hard the race is. As explained above, you can instantly read the race story with the panoramic view at a glance. 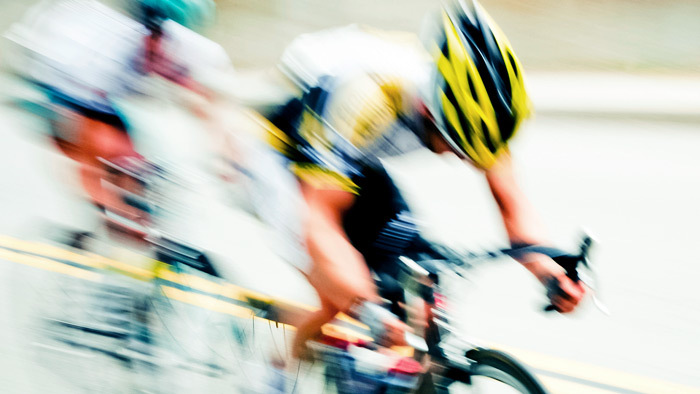 Some races or tests, such as a time trial, require a steady state effort to achieve a good outcome. If you spike your power too much, you will drain your energy very quickly. This chart immediately finds the over paced sections as shown in the picture below. This chart may be applicable to an IRONMAN to find over paced sections since the mean maximal power 20 minutes is self-determined in the race intensity. For rides that have a sets of intervals in the middle of the ride, you don’t need to look closer onto your computer screen to find the training sections. You can now easily find the core of the training by this chart. Using this chart, I have successfully been able to analyze the race and training files that I received from the riders in my country. It is a great joy to help them find weaknesses and strong points in the races that leads to a better strategy for next race.